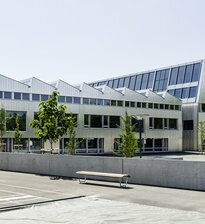 A new building known as «Wildenstein III» has been added to an existing school complex. 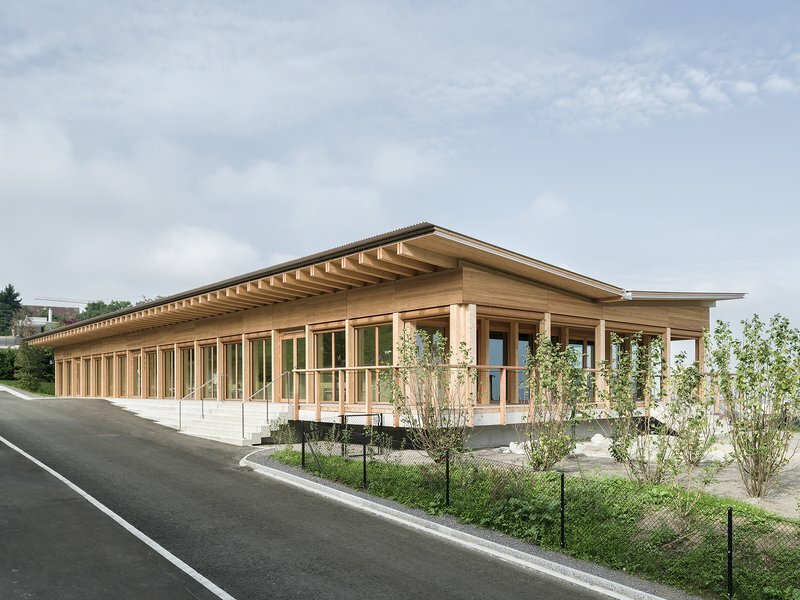 The filigree wooden structure contrasts markedly with the solid masonry buildings in the surrounding area. Resembling a pavilion (Latin: papillio = butterfly) with its delicate façade and transparency, the single-storey build-ing stands out from the terrain, floating slightly above and accentuating the sharp edge of the slope, while its distinctive butterfly roof blends in gracefully with the topography. The broad canopy protects the structure and creates a pergola around the building, widening into a covered terrace on the east side. The children thus have a spacious sheltered outdoor area to play in. 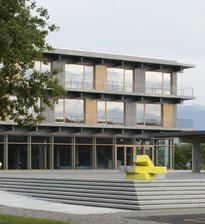 In addition to the kindergarten, the new building houses a learning studio and a cafeteria for the entire school complex. The layout is clearly legible, divided into three parallel spatial layers. The entrance is formed by a narrow, approximately forty-meter-long open area as the first layer of space. The middle layer accommodates all ancillary spaces and offices. Finally, the third layer holds the three main rooms, which open out to views over Lake Constance. In the kindergarten a versatile piece of play and work furniture generates atmospheric «children’s zones» of different scales. With glazed passageways, interior windows and sight lines through the building, the interior, like the exterior, is characterised by a high degree of transparency.